Residents in rural parts of Northern Ireland could have no access to cash if ATM raids continue, retailers have warned. Glyn Roberts, the head of Retail NI, was speaking after yet another cash machine was ripped from the wall of a garage in Co Fermanagh early yesterday morning. McAleer's Spar on the Dromore Road in Irvinestown was the fifth premises to be targeted in the province since the start of this year. The digger used in the attack is believed to have been stolen from a nearby building site, before being set alight shortly after the incident happened. Similar attacks have occurred across different counties, with an Asda store in Antrim having two ATMs torn out by a digger last month. 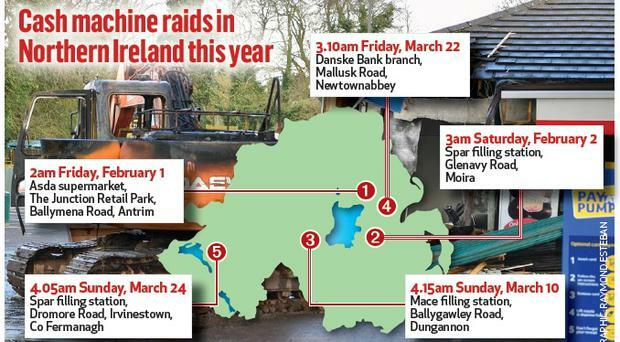 Other locations that have been affected are Omagh, Moira, Dungannon and Newtownabbey. On Friday, a Danske Bank branch in Mallusk had its built-in machine destroyed. Part of the grocery store in Irvinestown was badly damaged but reopened in the afternoon to continue trading. But Mr Roberts said such vandalism will have a real impact on rural communities if they continue at such an alarming rate. "This is concerning because it seems like there's an increase in these attacks, but it also seems that there are no no-go areas for the criminal gang or gangs behind these attacks," he said. "We saw the attack at the Danske Bank branch on Friday and then Irvinestown on Sunday morning and it appears to have emboldened them with the 'success' at banks now. "There's certainly concern among our members now about who's going to be next." Mr Roberts also urged retail businesses, particularly those close to building sites, to be "extra vigilant in the days to come". He added: "We're going to talk to colleagues in the banking and construction sectors about what we can collectively do together, because I'm very conscious that owners of these building sites are victims also." The PSNI's Organised Crime Branch set up a new team to deal with such incidents earlier this month, due to the increase in attacks. Detective Sergeant Brian Reid said: "Thieves used a digger to remove the 'built-in' cash machine from a filling station on the Dromore Road at around 4.05am, causing extensive damage to the building. We believe the culprits used a trailer to remove the ATM from the scene. "We also believe the digger was stolen from ground under development nearby. The digger was set alight at the scene immediately after the theft." Mr Reid said that police are investigating whether the attacks are linked. Ulster Unionist MLA Rosemary Barton described the theft as "despicable". She added: "It is frustrating to see yet another ATM ripped from the wall of a local business. The ATM is a crucial service in this local area and this latest incident has now deprived the community of yet another facility." "These despicable actions have become all too prevalent over the past few months across Fermanagh and South Tyrone. It must be made a priority now for the PSNI to put more resources into trying to prevent such deeds." Adding her condemnation in a tweet, DUP leader Arlene Foster said: "Another rural community robbed of an ATM. Thoughts are with the shop owners who have to rebuild. Huge inconvenience for the wider community too. "ATMs are being moved indoors and only available during office hours. Will be speaking to PSNI Fermanagh and Omagh about cracking down on the thieves. "This is another disgraceful attack on the local community in the county. It is an attack on a local business striving to provide a service to people and yet another blow to people who depend on this service to meet their needs."